Alice: A resplendent author who lives in Authorland, she returns through the Looking-glass and falls into her own story; all at the cost of seeking the answer to the Looking-glass question while singing the song: “It’s Only Polony”. 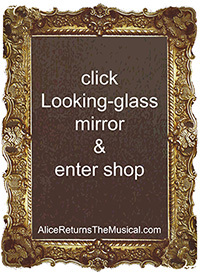 Miss Penopause: She is the alter-ego and writing inspiration of Alice, who lives on the other side of the Looking-glass. Miss Penopause doesn’t find it easy to string a sentence together, and forcefully inks disagreeable words into her memorandum book, but they often wriggle free, leaving Miss Penopause with many unruly paragraphs. Sings the song (reprise): “It’s Only Polony”. Paige Turner: A frightful book reviewer with outrageous appetite for devouring authors’ words. She sends Alice a Note-a-Rioty, threatening character assassination against Miss Penopause, by-way-of publishing a damning book review against Alice’s debut novel. The Whooie Bird: A majestic creature who glides along the Critical Path. He reveals through selective dialogue, how Alice and Miss Penopause should wit, not woo Paige Turner, to make her eat her own supercilious Note-a-Rioty. Plotimus and Themeibus: These two quarrelsome brothers refuse to agree who is the more important in any story – plot or theme – before singing “Mr and Ms’ery” in Alice and Miss Penopause’s company. Gramma: A rather rude female when first encountered by Alice and Miss Penopause, on account of her dislike for writers who overlook the rules of grammar, forcing her to grind a little more of her tooth enamel away. Upon sighting the Boobook Chick hatching from his shell, she sings the good-luck song: “Sunshine In Your Shoes”. Apostroflies: Vengeful insects who deposit their waste onto any writer who misplaces apostrophes. The Monumoose: A creative furzy furred creature, with handsome antlers and wings. He encourages Alice and Miss Penopause not to ride the Thesaurus too far through any story, otherwise “you’ll simply wear him out!” He sings the song: “Telephone The Ocean” in a tenor voice. The Validator: A different character of a difficult nature when provoked into dropping her Apple Pie manners, she is a trapper with frightening ways. Dandelion Clocks: Eccentric vain, not plain plants with silver hair. Semi-sopranos who sing the song: “Monetary Girl”. Column Inches: A ten foot tall journalist who sings a melancholy song to Paige Turner, called “Exclamation Marks”. Scrolls: Parchment creatures who display the most perfect page of each author’s due-for-release book (written in Looking-glass words) across their parchment fronts; to be reviewed by Paige Turner. They sing in baritone voices the song: “Tush Tush”. The Scarers: Woodland creatures with the appearance of scarefoes, they defend the book reviewers livelihoods in Word-sphere by talking pettifoggery nonsense. Bookworm: A doleful creature who is partial to fluffing his words. Conductor: Brusque character who admits sightseers aboard the Train-of-Thought; that travels the Word-sphere in an alphabetic blur. Administers: They hose-pipe parchment Scrolls with word flattery. Carrier Pigeons: Restless cooing, booing, hooing birds who await delivering Note-a-Rioties issued by Paige Turner on Recommence Day. Frog Footman: A betassled aide-de-camp to Paige Turner, who leaps into action with Read-It Wine. Boobook Chick: The embodiment of a story, only hatching from shell if its author nurtures it well with creative care and fruitful ideas. All characters in Alice Returns Through The Looking-Glass, are the creation of Zizzi Bonah, (with exception to the character of Alice, who was created by Lewis Carroll).